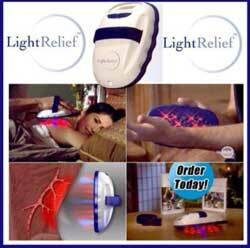 It provides topical heating for the purpose of elevating and/or maintaining tissue temperature. Use wherever heat application is prescribed for personal comfort and the temporary relief of minor muscle pain, joint pain, and stiffness. The Light Relief does not emit any x-rays or radiation and is totally silent. It creates a soothing mild warmth to the areas you are treating. For maximum results light relief is placed directly on the surface of the skin. It is FDA cleared to be safe and effective when used as instructed. Our standard Light Relief system works with six double ’A’ batteries. If you purchase your order with the one payment option, we will upgrade your warranty from a two year warranty to a 5 year warranty absolutely FREE!